Trying to get caught up with posted projects…I’m always behind…A few more turned boxes since they are so much fun to make! 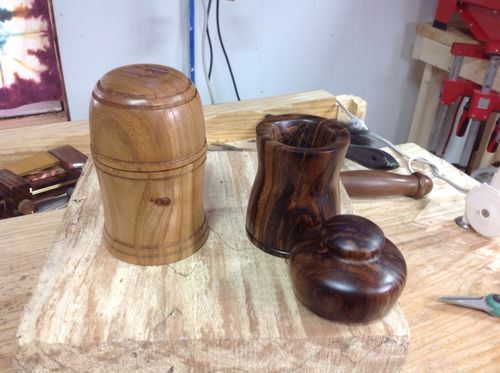 These 2 are turned from 3×3x6” stock; a difficult size to hollow! 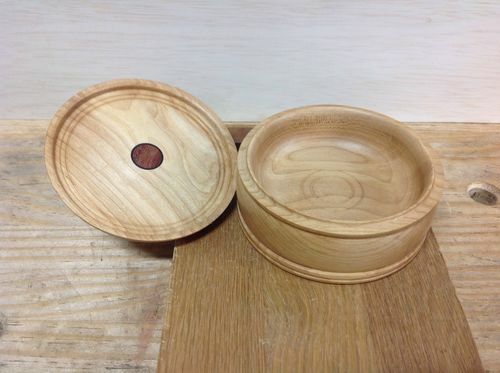 Left is Chinese Elm with a simple textured pattern on the lid. Right is Tamarind, I believe? This one is shaped from Black Walnut with a Maple Burl knob. 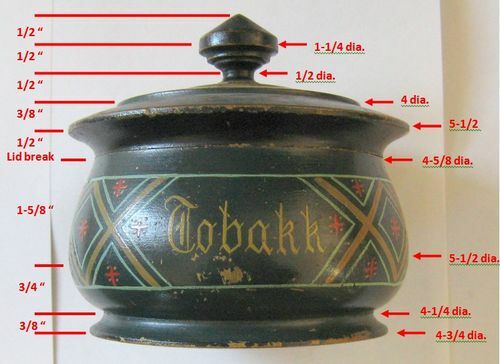 My finial knobs are epoxied into the lids at least ½” deep for strength. Last is a piece of Rock Maple and Bocote. I added a decorative ring from Ziricote and Bubinga on the underside of the lid as a surprise for anyone that looks! That all for now…comments and suggestions are always welcomed! Very nice Terry. I think the maple and bocote one is my favourite. Incredible work Terry. I love the decorative ring inside the maple box, such wonderful attention to detail. 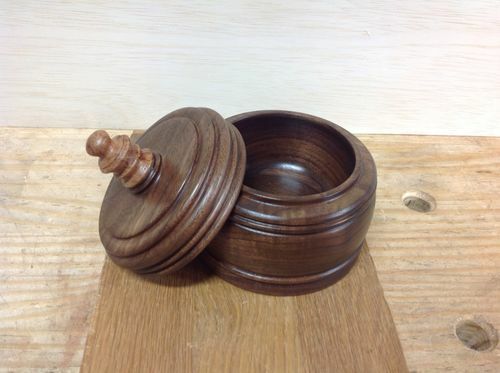 This is a very nice collection of turned boxes. Congratulations. 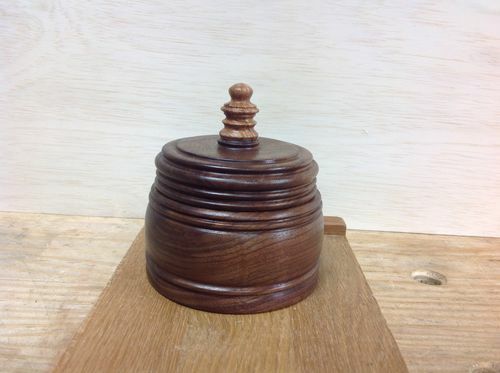 Still loving my TerryR original turned walnut box..
Terry those are beautiful. Your turning skills are top notch. 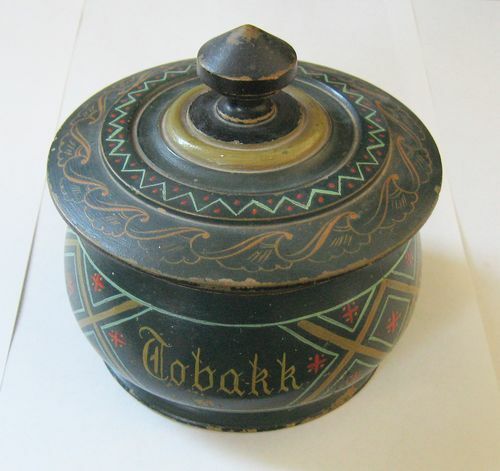 Since you love turning boxes and you love making pipes, why don’t you make one of these. 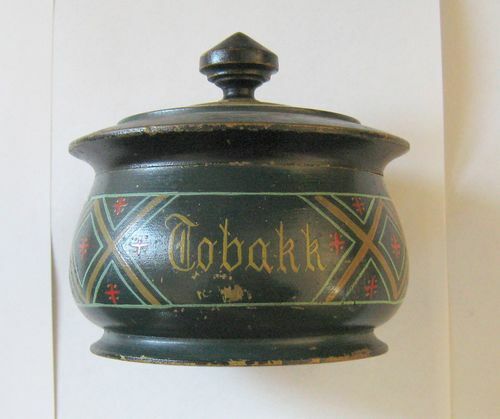 It is an original tobacco canister brought over from Norway by my wife’s grand or great grand parents. I can send you the dimensions if you want to make one. Nice work as usual Terry. 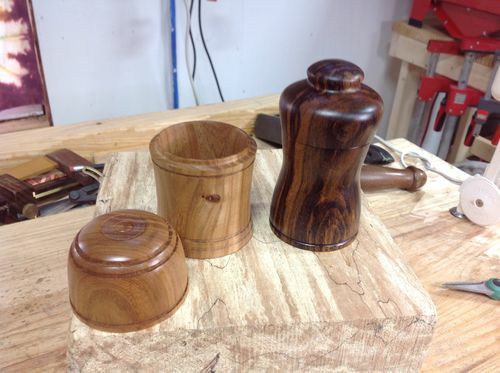 widdle, yes, all shaped while spinning…I’ll have to post a blog on how these are made…been wanting to do that. The trick is how to hold the workpiece! You’re gonna need to teach me to turn properly when you get to Colorado, Terry. Amazing work. Here you go Terry. 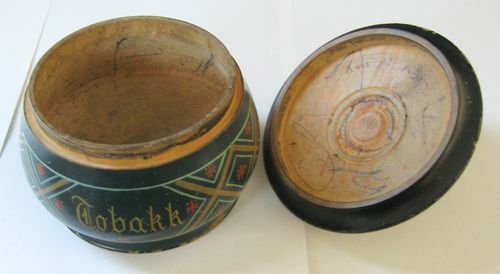 I believe this is made out of birch, probably Karelian birch. 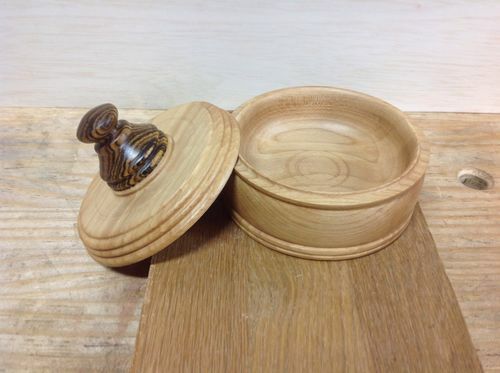 The inside dimensions are 2-3/4” tall and shaped to the same contour as the outside. The walls feel like about 3/16 to 1/4 thick.